It the mid of the month and we have The Envy Box with a special theme. I loved the print on the goes and it goes perfectly with the theme - Lashes and Pouts. As you could have guessed by now the products are for your eyes, lashes, and lips. The best part - there are five products and each of them is full size. They also sent a card for season's greetings. 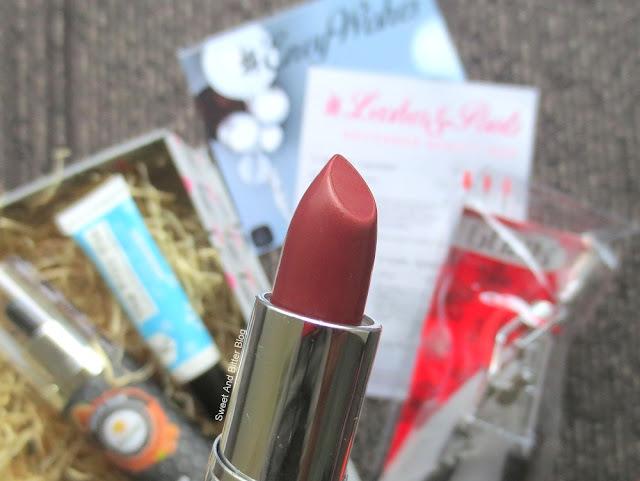 Kronokare The Frizz Kiss Lip Balm (Full size, Rs 95 for 10ml): My Envy Box sent it last year December and the repeated it again. I like it and interestingly, I reviewed it yesterday. At least one of my confusion is not clear - it contains no parabens and no silicones - according to the new packaging. But, my actual doubt still holds true. Bliscent Raspberry Lip Butter (Full size, Rs 150 for 5gms): A lip balm AND a lip butter? I understand the theme is 'Pouts' but this is kind of lazy and repetitive. If it had to be lip product, they could have sent a lip scrub. I loved the one from last month. 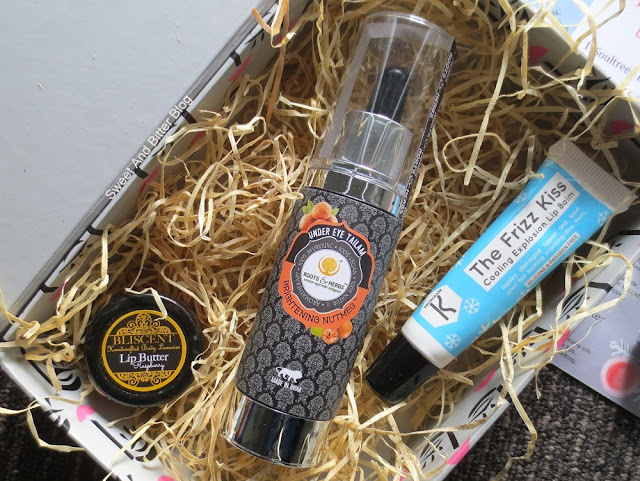 I would have even liked it if they had resent that lip scrub in this December box. Roots and Herbs Under Eye Tailam Brightening Nutmeg ( Full Size, Rs 1190 for 50ml): I have seen the counter for this brand at Quest Mall. I tried to buy from them, but the sales rep weren't the most welcoming ones. This product sounds interesting with all good ingredients. But, it only mentions key ingredients and not the complete list. Another doubt - when should I used it. The instructions warn against overnight use. One should use it for half an hour or two hours max. Now, I am confused. Help me if you have figured it out. I haven't even opened the bottle. Soultree Cocoa Rich Lipstick 906 (Full Size, Rs 550 for 4.5gm): Made with organic ghee, wild honey, and sweet almond. It is free of synthetic colors, fragrances, and preservatives. It does sounds promising. Unfortunately, this shade contains shimmer. Yet to test on lips. 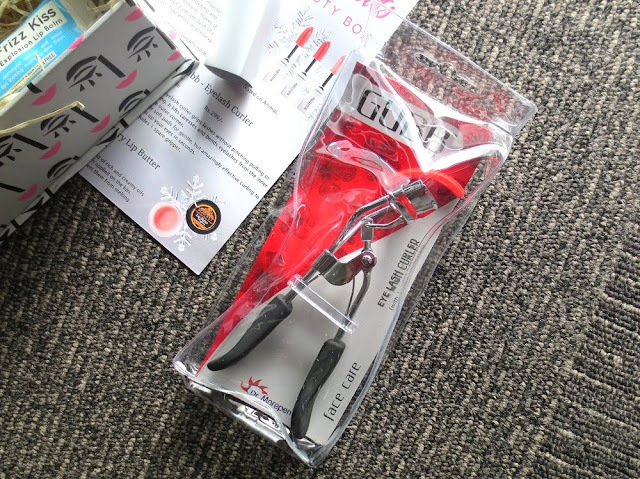 Gubb Eyelash Curler (Full Size, Rs 299): An accessory! What's not to love? They also have a spare gripper for future use. Overall: I liked it - five products, all full size, sticking to the theme is what set it apart. I have to find my way around few products. 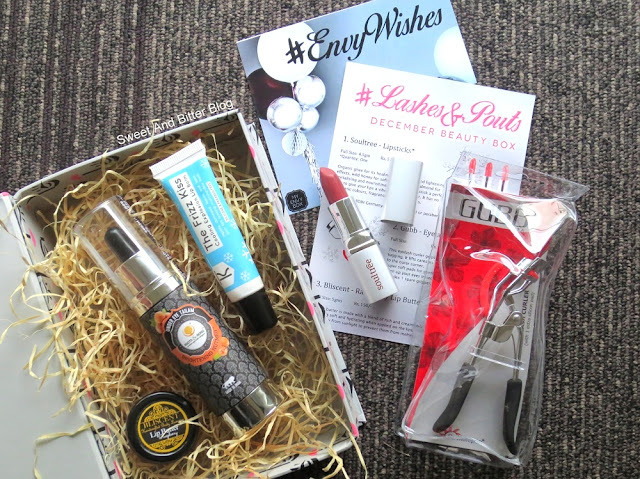 How do you find December's My Envy Box? *sent by PR in exchange for my honest review.